Each of my CNC mills has a home designed and produced tooling plate. 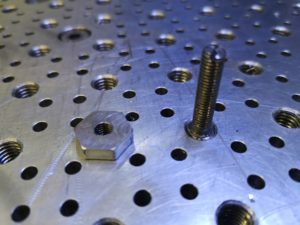 Both have a 25mm pitch matrix of tapped mounting holes and a further submatrix of 3.7mm tooling pin holes. Why 3.7mm ? So I can turn down 4mm silver steel for the tooling pins to create a retaining shoulder. My small CNC plate has M5 tapped holes and the Tormach 440 has M8 tapped holes. What struct me was that I has starting to create dual sets of hold down tooling, some with M5 and some with M8 mounting holes. Not a good idea. (Entertaining and therapeutic though it might be to have ‘tooling days’). Clearly a mounting with M8 holes was not much use with tooling having M5 mounting holes but the other way round would work if I had M8 to M5 adaptors. As a result I have spent the day creating adaptors which you could call male and female. 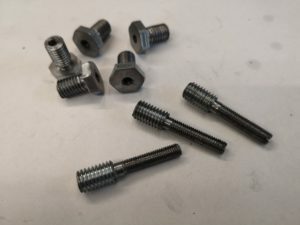 Both are made from M8 hex head tensile screws with the female ones retaining the M8 head and the male ones utilising the cut off portion of thread. I had to undercut the thread ends behind the heads so the female adaptors would sit flush. Having undercut I then skimmed all the tops of the hex heads to be same depth. All the turning was done with the ER25 collet chuck instead of the 3 jaw which is normally fitted to the Myford. The male adaptor versions were a pain to turn down to M5 diameter and had to be done incrementally as the M8 threaded end could not be heavily gripped in the collet. The female versions are quite useful if a job is being run on the Tormach that needs suspending above the table so it can machined to full stock depth. Nothing revolutionary or original but a day well spent.